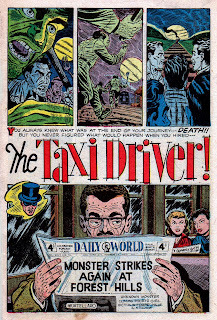 THE HORRORS OF IT ALL: The Taxi Driver! Got another wild and wooly weirdie for you today from the Jan/Feb 1953 issue of Mister Mystery #9. 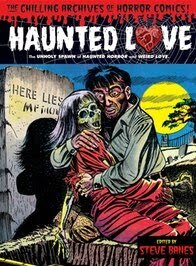 Is it just me or does anyone else think that Daniel Clowes must have read this one as a kid? The title lettering, the sweaty close-ups, some of this just has that great Eightball vibe to me. Maybe he was a fan of Tony Mortellaro? 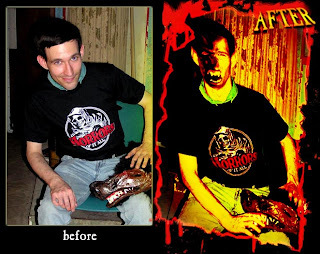 Live from the film set of Werewolf Cemetery its Todd, dressed for indie horror film success in his brand new THOIA tee shirt. But watch out Todd, some of those severed wolf head props look a little too real for--- AIEEEE! It’s still alive!!! Run! Run!!! Someone run for help… someone else call the FX and make-up people and tell them they’re no longer needed!! Keep the cameras rolling--- and run!!! Be sure to get your very own THOIA tee NOW. All sizes back in stock, and only $20.00 each with FREE shipping for US residents And if you’ve already got one and haven’t sent in a photo then what the Hell are you waitin’ for?! Run!!! Robert Crumb has a dark side i've always seen! Oh, that's hilarious. I didn't realize I was going to get the Photoshop treatment. I particularly like how you made me look presentable in the first picture. 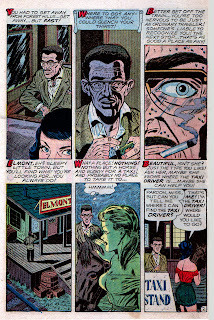 Weird Mysteries stole this hook, line, and sinker in August 1953, changing the title from "The Taxi Driver" to "Full Moon." It was a treat to read the original. You could do an anthology with this plot. How many stories are there where the victim is a bigger monster than the predator? Still, it was nicely done. Very suggestive for its time. I love a good post-apocalypse, especially when it's presented as offhandedly as this one was. Why have mushroom clouds and road warriors and vine-covered skyscrapers and punk cannibals? So overt. All you really need to do is show a black-rainy and heavily bilious nuclear winter for two pages and two panels before finally dropping the hint in dialog that the sun is finally setting. Oh, and hairy green and blue fanged mutants, of course. And speaking of that: nice photo Todd. I see you have been bitten by the Photoshop. Beware of the copyright circle on your palm, it is the harbinger of doom. Thanks, Cavin. Either that is some funky lighting, or I am the first werewolf with jaundice. While I did in fact see the ending coming from the bottom of the second page, it was still well delivered. Actually, I thought the guy was a vampire, too, till he started getting hairy. For some sick reason I am reminded of the horrid episode of Scooby Doo where the werewolves and vampires square off against each other and fight but since they keep biting the other ones they just keep changing back and forth from vampire to werewolf and back again. And of course now I can't remember how the damn thing ends! I NEVER GET TIRED OF THE OLD MONSTER SWITCHEROO LIKE THIS. ATLAS DID IT ALL THE TIME. AND THIS STORY DOES FEEL MORE MODERN THAN MOST 50'S TALES AND YOU NAILED IT WITH CLOWES ESPECIALLY THAT SPLASH AND TITLE AND PANELS 2 AND 3 ON THE SECONDPAGE. I find myself wondering what kinds of Easter Eggs we're missing in that detailed front page on the splash. The fact that rain is forecast for the ENTIRE COUNTRY? The byline for "H. Kantor"? The 4-cent price? Volume 15, #71? It MEANS something, dammit! The sweatiness of the main character does indeed invite the Crumb comparisons, though to me he looks more like Groucho-with-a-Fro. But both would have a weakness for a side-braid, a Daisy-Mae blouse, and some striped frill-hemmed bloomer skorts, that much is obvious. And on pg 3--holy crap! That taxi-coach is HUGE! Daisy and the Werewolf are absolutely DWARFED by its massiveness! 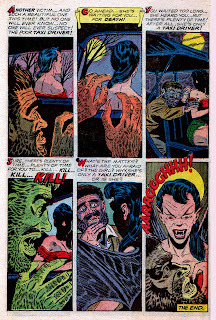 So much irony in this story- he goes to all that trouble to take a train to some sparrow fart town in the middle of nowhere, gets off the train to find an ancient taxi service, transforms into a werewolf, gets ready to devour the hot babe, only to have it all shot to hell when he discovers she is a damn vampire! 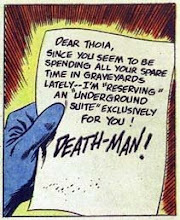 Things just never work out right in the horror comics. That's why I love them!!! I Talked With the Dead! IN STORES NOW! 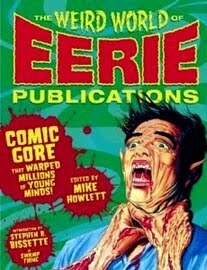 Collects the entire 3 issue mini series, plus bonuses! 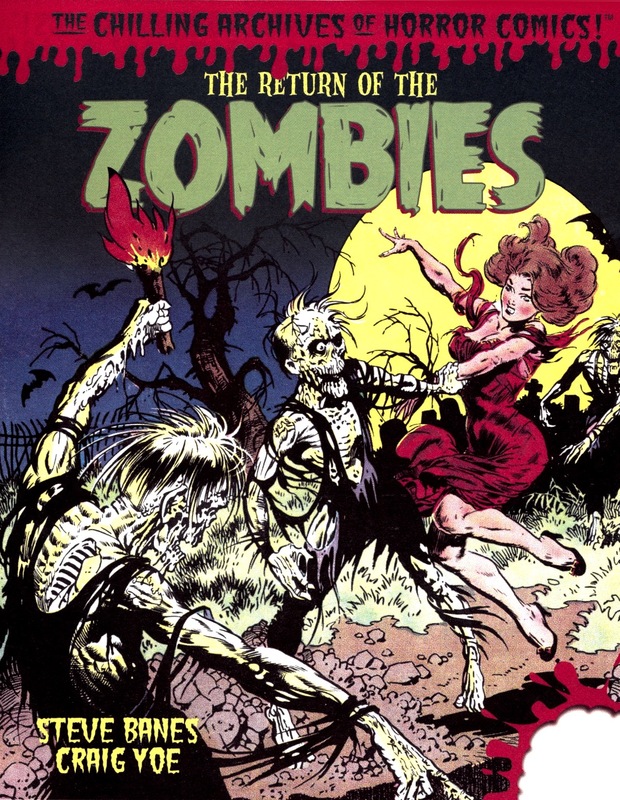 THE RETURN OF THE ZOMBIES!!! THE MOST HAUNTED GROUP EVER! What? Mr. Karswell has yet ANOTHER blog of cool stuff?!! 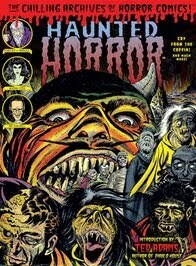 The FIRST Monster Fan Mag! Bringing comics to life onstage! 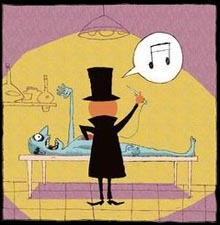 IT'S ALIVE 2! Get it NOW!! 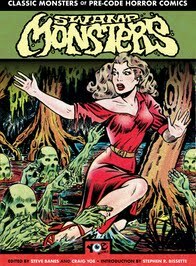 "...incessantly awesome... a wealth of classic horror strips reproduced in all their crude, four-color glory..."
"...an essential horror comics blog. Pre-code goodness through and through!" "I love your blog, I check it every single day!" 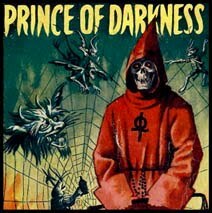 "...the capital of online comic book horrors... saying "Not the best story THOIA has run" is a bit like saying "one of Beethoven's lesser symphonies!" 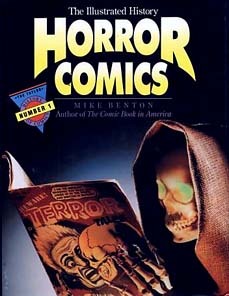 "...the object of all horror chicks' wet dreams... a comixkaze of awesome!" 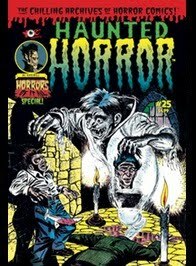 "...an online repository of vintage comic fear fare where individual stories from long out-of-print issues are posted in high resolution, page by page. 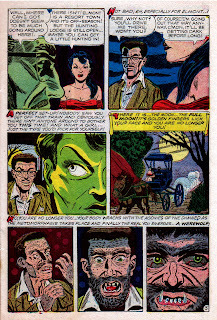 For a fan of EC, Atlas and other Silver Age-era comic companies, it is pure heaven (and hell)..."
"...a skeletal slew of complete scans of pre-code comics..."
"Karswell has turned his blog into the fantastic cult favorite it is..."
"...kickass blog (and if you aren't a reader yet, whyever not? Do you know what you're missing out on?)" 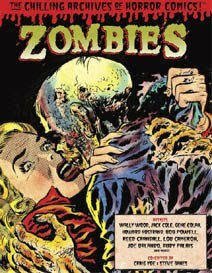 " Great for whiling away the hours between the start of the working day and home-time..."
"...the master of vintage horror comics, and I bow to his general greatness." 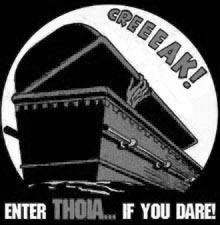 "THOIA is THE blog for pre-code horror comics." 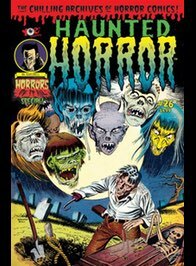 "...the premiere home on the web for amazing pre-code HORROR comic stories... the absolute best bastion of HORROR on the web!" 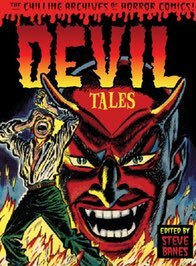 "...fine selection of pre-code comics and quality scans... Karwell’s is the only one I can think of with the focus on great, old school horror stories." 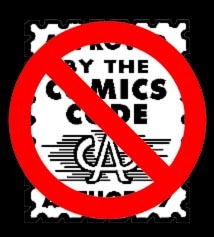 "Feverishly devoted to pre-Comics Code funny books... click any image for a full-size, readable version of the page and delve in. Horror history awaits."